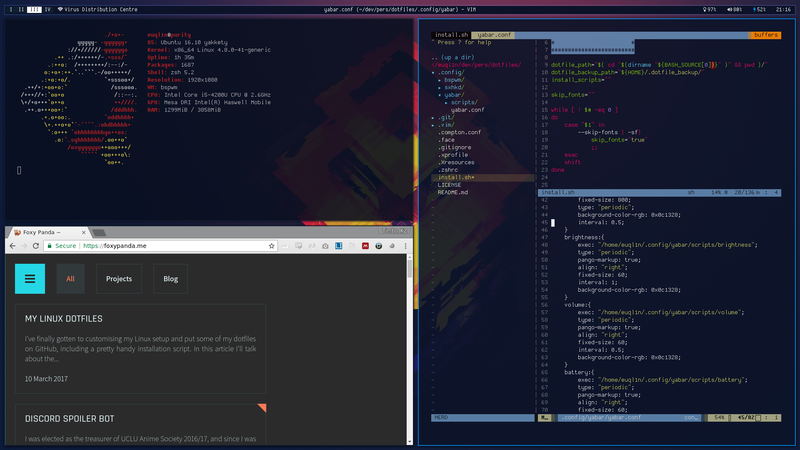 I've finally gotten to customising my Linux setup and put some of my dotfiles on GitHub, including a pretty handy installation script (gave up the installation script in favour of yadm). Check out the README.md file in the repo linked above to see the description of the tools I used. As I'll keep updating that readme as I adjust my dotfiles. Note: At the time of writing, to save some time on configuration I use Ubuntu Server 16.10 and then customise it to my liking, so below you'll mostly see Ubuntu. That said, I'm very interested in Arch Linux so at some point I'm going to migrate to it. Be warned - I like to give my machines silly names. Below you can see a screenshot from Purity, my Sony VAIO Pro 13 laptop.